As any of you regular TLS blog readers may know, Conscious Discipline, a classroom management system developed by Dr. Becky Bailey, is a favorite blog topic. Conscious Discipline begins with learning and practicing the 7 Powers of Self-Control. These powers shift the focus of interactions from blame to solutions, from punishment to teaching, from fear to love. We have introduced two of these powers: Composure = becoming the person you want to be and Encouragement = building a school family. I recently spoke to Arryan who teaches with Paige and Cicely in the yellow building. I was inspired to highlight a very touching and tangible piece of “Encouragement” in her classroom. 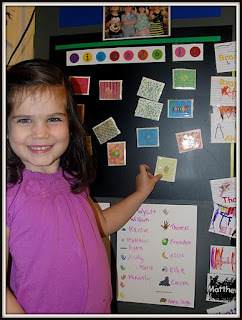 It involves noticing the children’s accomplishments and encouraging them by describing their actions. Becky Bailey says when you notice children without judging them, you introduce unconditional love and acceptance into their lives. When you notice how a child is fulfilling his/her commitments, and describe exactly what they did, while offering encouragement, the child experiences positive self esteem and resiliency. "You (describe what they did), so (describe how they helped others). That was helpful (or kind)." 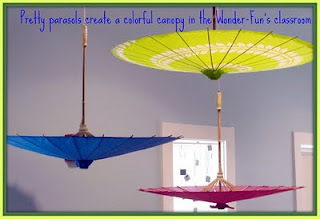 EX: "Deborah, you showed your friends 'ballooning' so that they could relax. That was helpful!" "Edgar, you built a tower with blocks. You did it!" Arryan’s classroom incorporates a “You did it!” board. The class uses the board for highlighting individual goals, as well as class-wide goals such as being able to settle in for nap on their mats. 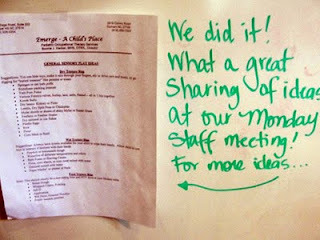 When there is an occasion to encourage by acknowledging goals and accomplishments, the children go to the board and place their picture (or in this case symbol) onto the board. The day is filled with opportunities to encourage one another. When someone is spotted doing something helpful or accomplishing an individual goal, the teachers get everyone’s attention in order to share the accomplishment. 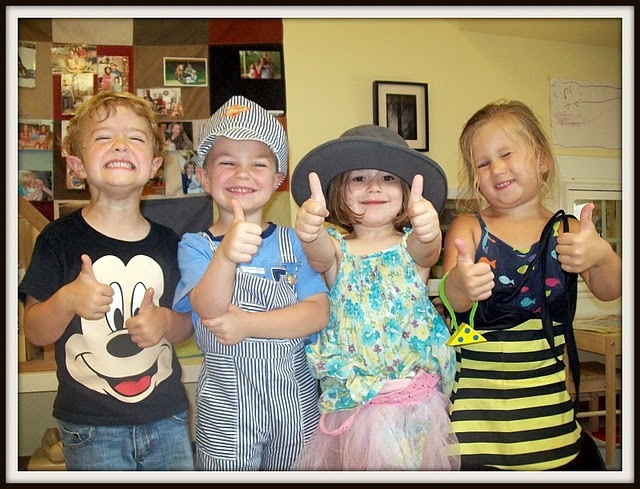 Together, the class gives a collective thumbs-up to their classmate. Note the amazing thumbs-up (x4 friends) photo by Arryan, which is the photo that adorns their classroom’s “You did it!” board. Recently, a classmate was applauded with thumbs-up who was calm and collected when he spilled his water. He got up to get a paper towel to dry the spill without getting upset. 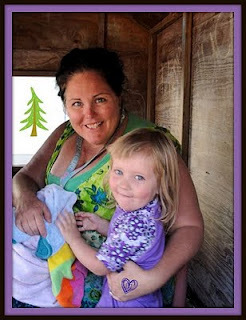 Through Conscious Discipline the children are learning the language of encouragement. They can use encouragement at home and at school. They can use encouragement for others and to support and encourage themselves. Sarah Grace was in her classroom getting ready for nap time. Three different friends were getting very frustrated putting their sheets on their mats. Sarah Grace walked to each one and said, "Don't worry. Let me show you how I do it." She calmly walked to each friend and helped them. After helping them, she said "I did it! I showed my friends and calmed them down!". You can also teach your children to recognize their own achievements and nurture their cooperative spirit by helping them say "I did it" aloud. Every night you can incorporate “You did its!” into the bedtime routine. You can allow older children and adults to say what they did during mealtime and every one can respond "You did it!". You can have a “You did it!” board at home. We all benefit from encouragement. In a recent staff meeting Ms. Arryan suggested creating a “You did it!” board for the staff. 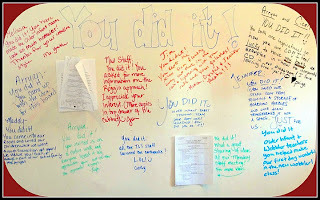 A board was placed in the staff room and in no time it was filled with uplifting “You did its!” from staff members. What better way to teach the children about Encouragement than by “practicing” it on one another and incorporating Encouragement into our lives. “It is always a challenge to open a new classroom. No matter how much support and encouragement we have during the process, it is just plain stressful in the moment. Period. We have recently reconfigured our Infant Program in order to welcome the newest members of many of our current families. There was a huge need for the infant spots. A reconfiguration had to happen. AND be ready to welcome the children and parents... nearly overnight. In the end, the move was seamless, the classrooms are BEAUTIFUL, the teaching teams came together as cohesive and distinct entities.... And the children and families are wonderful and most welcome. Finally, A “You Did It!” goes out to Chef Nate who steadfastly organized, ordered, prepared, and cooked food for our WONDERFUL picnic this past weekend that many of you were able to enjoy. In addition, we send out “You Did Its” to Todd Hannon (Spencer’s dad), Steve Dock (Jennifer’s husband), and Mark Vavrousek (Wendy’s husband) who worked all night to support Chef Nate. Hopefully as adults we can learn from Sarah Grace and not shy away from patting our own backs once in a while! Feel free to comment and leave your own “You did its!”. If Hollywood made a movie about your life, whom would you like to see play the lead role as you? Sandra Bullock!! Our family has just adopted a dog named Molly from the Paulson family. The Paulson's were fostering Molly while her owner was serving his country in Afghanistan. Molly's owner is unable to return from Afghanistan. 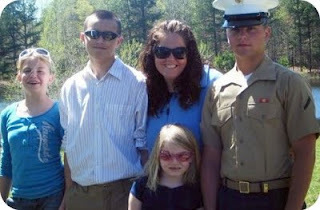 Having two sons in the Military this touched my heart. It is a pleasure for us to have Molly. She is a wonderful six year old black lab and we LOVE her. What is your happiest childhood memory/what makes it so special? My happiest childhood memory is when a group of girls in my neighborhood would put on plays for our parents. We would practice and make our own scripts from shows such as "One Day at a Time" and "Alice". We would use one of the girls’ carports as our stage. Sometimes we would persuade one of the boys in the neighborhood to play Mel. As a child I spent so much time outside with my friends running around for hours with no worries.....well, except who was going to play which parts. Found a riding truck for TLS for a quarter at a yard sale. About nine years ago I made a Glenda costume for my daughter Sydney. It took me months to make for Halloween. She had the huge crown and wand. It was the hardest costume I have ever made. Sydney was Glenda and her friend was Dorthy. That costume lasted years in my daughter's dress up box. As a young girl I used to design wedding dresses. I always thought I would make my own wedding dress one day. After my Glenda making costume I realized just how much work goes into something so beautiful. Social Deviance with John Neathery at Alamance Community College, this class really took you outside your personal bubble. I made some life changing changes after that class for the better. A big thank you to Susan for sharing, for her dedication to The Little School, and for her creative landscaping skills (to be viewed outside her classroom :). This is a great entry! I truly had no idea how pervasive "thumbs up" is in school. We have started incorporating this kind of positive reinforcement at home, and William loves it.